For day three of using Cook’s Country recipes, I picked out this stir fry to give a try . I love making stir fry dinners since they are quick and easy and make good use of some fresh vegetables. Don’t be put off by the name of this recipe; it is not very spicy at all and has great flavor to it. There aren’t a lot of ingredients in this one at all. The only item I had to go out and buy was the Asian chili-garlic sauce, and you could easily omit it or just use any chili sauce you would like as a substitute and I think it would be just fine. Whisk 1/2 cup of the chicken broth, soy sauce, 1 tablespoon of the cornstarch, chili-garlic sauce and the sesame oil together in a bowl. set aside. Toss the pork, 1 tablespoon of vegetable oil and the remaining 1 tablespoon of the cornstarch together in a bowl. Heat 2 teaspoons of the vegetable oil in a large non-stick skillet over medium-high heat until just smoking. Brown half of the pork, about 3 to 5 minutes. Transfer the pork to a plate. Repeat the process with 2 teaspoons of vegetable oil and the remaining pork. Heat the remaining 2 teaspoons of vegetable oil in a now-empty skillet until just smoking. Add the broccoli and cook until it turns bright green, about 1 minute. Add the remaining 1/4 cup of the chicken broth and cook, covered, until the broccoli is tender, about 3 minutes. Add the ginger and the garlic and cook until they are fragrant, about 30 seconds. 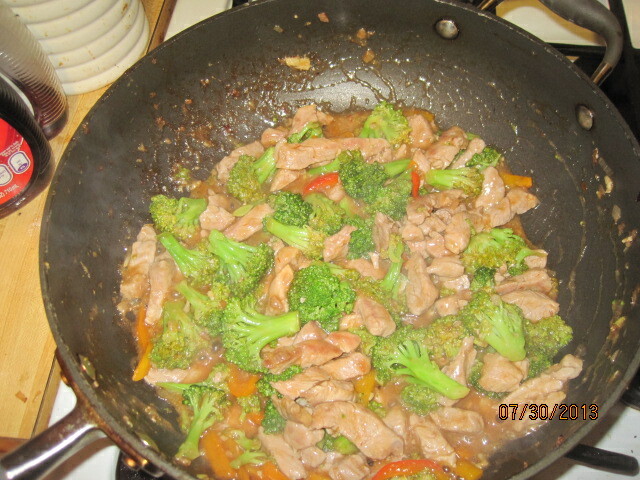 Stir in the soy sauce mixture and cook until it is thickened, about 2 minutes. Return the pork and any accumulated juices to the skillet and cook until the pork is heated through, about 1 minute. Serve. I did add some yellow, orange and red pepper and a shallot to the recipe, putting them in the skillet and cooking them for about a minute or two before I put the broccoli in the skillet. I think they added some nice color and flavor to the dish. The sauce adhered nicely to the pork thanks to the cornstarch and it had a good flavor with just a little kick to it. I served this dish with white rice and that was it. 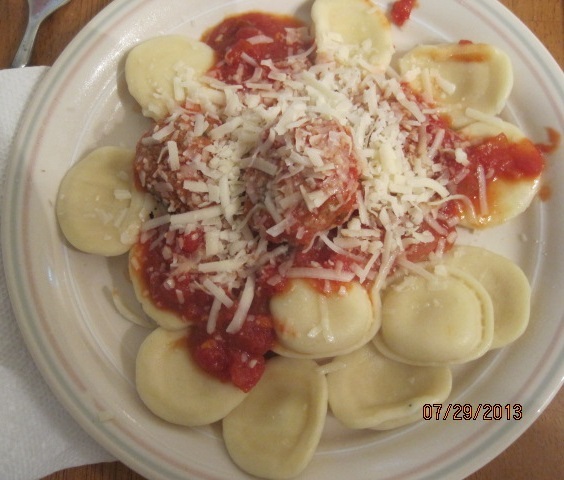 It is a great, simple dinner that you can have prepared and done in under 30 minutes so it is perfect for any weeknight meal. That’s all I have for today. Check back next time for another Cook’s Country for this week. The next recipe up will be for some quick chicken Parmesan sub sandwiches that I am making tonight, so you want to check back for that one. I also have a recipe from Bon Appetit for a wonderful peach-blueberry ice cream pie that I made that I will be posting soon. You don’t want to miss that one. Until next time, enjoy the rest of your day and enjoy your meal! I think everyone has their own meatball recipe that they love. Odds are it was something that was handed down from generation to generation and you have gotten so used to having it that way that you don’t really stray from the method. There’s nothing wrong with that – if it isn’t broken, don’t fix it. However, much like I am with my meatloaf recipes, I like to experiment with different meatball recipes. I am always on the lookout for something tastier when it comes to having a meatball. My experience very often with meatballs when I have had them out at various places is that they either have no flavor because they do not have much in the way of herbs and spices and are all breading, or they are soft and mushy because they have cooked in the sauce too long and no longer have flavor of their own. When I looked through Cook’s Country and saw this recipe, it sounded like a great one to try. For the onion mixture, Heat the oil in a Dutch oven over medium-high heat until shimmering. Add the onions and cook until they are golden brown, about 10 to 15 minutes. Add the garlic, oregano, and pepper flakes and cook until fragrant, about 30 seconds. Transfer half of the onion mixture to a large bowl and set aside. For the marinara: Add the tomato paste to the onion mixture remaining in the Dutch oven and cook until it is fragrant, about 1 minute. Add the wine and cook until slightly thickened, about 2 minutes. Stir in the crushed tomatoes and water and simmer over low heat until the sauce has thickened, about 45 to 60 minutes. Stir in the Parmesan cheese and basil. Season with salt and pepper to taste. For the meatballs: Meanwhile, adjust an oven rack to the upper-middle position and heat the oven to 475 degrees. Mash the bread and the milk together in the bowl with the reserved onion mixture until it is thoroughly combined. Add the sausage, Parmesan cheese, parsley, eggs, garlic and salt and mash to combine. Add the beef and gently knead with your hands until combined (try not to overwork the mixture). Form the mixture into large meatballs (about 2 inches), place the meatballs on a rimmed baking sheet and bake until they are well browned, about 20 minutes. Transfer the meatballs to the pot with the thickened sauce and simmer for 15 minutes before serving. This recipe does not make quite a bit (the recipe says it serves 8), so you may want to freeze some to have on hand for future meals. The meatballs and sauce should freeze well and will keep for up to 1 month. There are a few notes about this recipe. Browning the onions in the same pot you are going to make the sauce in saves you a few steps and gives great flavor to the sauce and the meatballs. Also, you want to make sure that you do add some water in when you add the crushed tomatoes. Without it, the sauce will over-reduce in 45 minutes and be too thick for your use. For the meatballs, making the mash of bread and milk (called a panade) will bind the meatballs better than any breadcrumb you buy at the store and with the onion mixture will have a lot more flavor. Using the Italian sausage, Parmesan garlic and parsley also help with the binding and they give the meatballs some great flavor. You want to make sure you do not overwork the mixture when you add the beef; just blend it gently until everything is mixed and you won’t end up with rubbery meatballs. I love baking the meatballs in the oven over the stove top because you seem to get better overall browning in the oven and it’s a lot neater than using oil or butter to brown them. Naturally, you can serve this with pasta or make meatball subs (which I did for myself with some garlic bread since I don’t eat pasta). Michelle and Sean actually had theirs over cheese ravioli. Now I am no pasta expert, especially since I don’t eat it, but I do know how to cook it and there are a few tips you should follow. Make sure you salt the water to season the pasta properly. You want to be sure you stir the pasta as soon as you get it in the water to prevent it from sticking to the pot (I hate cleaning stuck pasta out of a pot!) and then stir it every few minutes as it cooks so it doesn’t all clump together. Adding oil to the water doesn’t really do anything; it won’t prevent the pasta from sticking and it will keep sauce from being absorbed. Also, you know how you like your own pasta; don’t go by what the package says. Check it often to see if it is done to your liking by fishing a piece out and trying it yourself. Finally, even I as a non-pasta eater know you shouldn’t rinse off your pasta. It washes all the starch off the pasta that helps the sauce adhere nicely. That’s all for today. Check back next time for another Cook’s Country recipe this week. 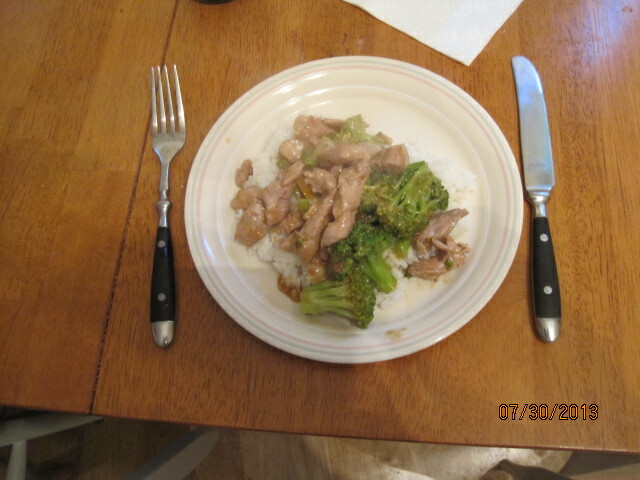 Tomorrow you will find a recipe for a spicy pork and broccoli stir fry. It promises to be tasty, so come back and check it out. Until then, enjoy the rest of your day and enjoy your meal! I have always been a fan of America’s Test Kitchen, Cook’s Illustrated and Cook’s Country. I follow them on Facebook and Twitter and have several of the cookbooks. I also recently started getting the Cook’s Country magazine via subscription and I have to say I really like it. The recipes are great with easy to follow steps and they give you all kinds of great cooking advice as far as techniques, pantry items and equipment. For this week, I decided to do some of the Cook’s Country recipes I have been trying lately. 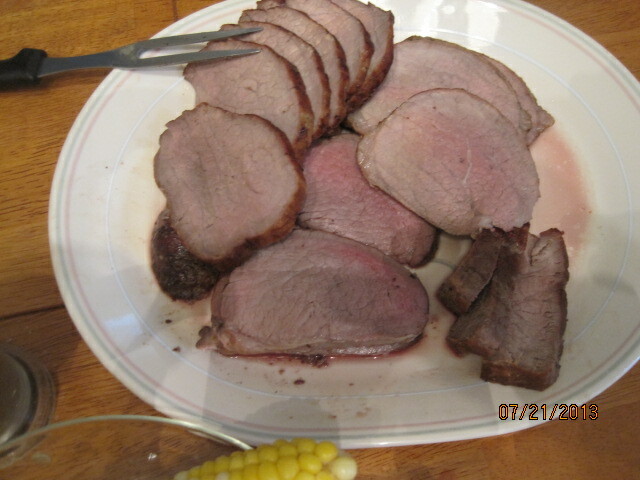 First up is the roast beef dinner I made last week. Luckily I picked one of the cooler days to give it a try so I could use the oven. Pat the roast dry with paper towels and rub with 2 teaspoons of salt. Wrap the roast in plastic wrap and refrigerate at least 1 hour and up to 24 hours. Adjust an oven rack to the middle position and heat the oven to 225 degrees. Pat the roast dry with paper towels and rub with 2 teaspoons of pepper. Heat the oil in a large, oven-safe skillet over medium-high heat until it is just smoking. Brown the roast all over on all sides, about 8 to 12 minutes; transfer the roast to a plate. Pour off all but 2 tablespoons of the fat from the pan. Add the butter to the skillet and melt it over medium heat. Cook the carrots, onion and celery until they are lightly browned, about 6 to 8 minutes. Add the flour and the tomato paste and cook until the flour is golden and the paste begins to darken, about 2 minutes. Off the heat, push the vegetables to the center of the pan. Place the roast on top of the vegetables and transfer the skillet to the oven. Cook the roast until the meat registers 125 degrees (for medium-rare), about 2 1/2 to 3 1/2 hours. Transfer the roast to a carving board, tent with foil and allow the meat to rest for 20 minutes. Meanwhile, keeping in mind that the skillet handle will still be quite hot, return the skillet with vegetables to medium-high heat and cook, stirring occasionally, until the vegetables are a deep golden brown, about 5 minutes. Slowly whisk in the consomme and water, scraping up any browned bits, and bring it to a boil. Reduce the heat to medium and simmer until the gravy is thickened, about 10 to 15 minutes. Strain the gravy through a fine mesh strainer into a serving bowl. Discard the vegetables. Season the gravy with salt and pepper to taste. Thinly slice the roast crosswise against the grain and serve with the gravy. Cooking the roast beef in this method made things much easier. You do a slow roasting and everything is done in just one pan, making cleanup even easier. Salting the meat helps a great deal in drawing out some of the moisture from the meat. Also, instead of flouring the meat beforehand and searing it, adding the flour to the vegetables instead helps you eliminate that pasty flavor a roast can get from raw flour and still lets you make a rich, dark gravy. You could certainly use water instead of the beef broth when making the gravy, but the broth really does help add another layer of flavor to the gravy, so I would use it. Of course, you also then have options with leftovers like making things such as open-faced roast beef sandwiches, French dip sandwiches or Philly cheesesteaks. I served the roast beef with mashed potatoes and some fresh corn on the cob and broccoli. That’s all I have for today. Check back next time to see another Cook’s Country recipe. This time I will be making the meatballs and marinara recipe that appears in one of the issues I just received. Be sure to check that one out tomorrow. Until then, enjoy the rest of your day and enjoy your meal! There are few things better than having a nice steak on the grill. This recipe, from Williams-Sonoma gives you a chance to make a basic steak and potatoes meal with some nice seasoning and not a lot of effort on your part. There are only 8 ingredients in the whole recipe and it doesn’t take much longer than 30 minutes to make the whole meal. Put the potatoes in a large saucepan and add water to cover the potatoes by 1 inch. Bring the water to a boil over high heat, then reduce the heat to medium-high and cook until the potatoes are almost tender, about 10 minutes. Drain and set aside. In a large fry pan over medium heat, warm 2 tablespoons of the olive oil. When the oil is shimmering, add the potatoes and toss gently to coat them with the oil. Cook the potatoes without turning until they are nicely browned on the bottom, about 5 minutes. Sprinkle with 1/2 teaspoon of salt and pepper to taste, turn and cook, again without turning, until the potatoes are browned on the second side, 5 minutes longer. Stir and cook for a few more minutes to finish browning the potatoes and crisping the edges. Meanwhile, prepare a fire in a charcoal grill or preheat a gas grill to high. In a bowl, whisk together 2 tablespoons of olive oil, the red wine vinegar, lemon juice and chile. If you are using charcoal, spread the hot coals across one half of the bottom of the grill and leave the other half clear to create a cool zone. Tie the rosemary sprigs together at one end, using kitchen string, to make a brush. Using the rosemary, brush the marinade all over the steaks on both sides. Sprinkle both sides of the steaks with salt. Arrange the steaks on the grill directly over the heat and sear for 2 minutes. Turn the steaks and sear for 2 minutes on the second side. If you are using charcoal, move the steaks to the indirect heat. If you are using gas, reduce the heat to medium and grill for about 8 minutes longer for medium-rare, turning once or twice and brushing again with the marinade as they cook. Transfer the steaks to a cutting board, tent with aluminum foil and let rest for 5 minutes. Divide each steak into two pieces and arrange on dinner plates with potatoes around the steak and serve. Just a couple of things about this recipe. I did make a couple of substitutions and I think they both worked out well. I did use strip steaks instead of Porterhouse since there is a big price difference between the two. I also used a bundle of basil leaves instead of the rosemary since Michelle and Sean do not really eat rosemary. I liked the flavor that came from the fresh basil anyway. I also made a quick tomato salad to go along with the meal. Finally, I added some mushrooms and shallots to a small pan and sautéed them with a little bit of the leftover marinade to use to top the steak and it turned out great. It was a very quick meal that you can do any night of the week. That’s all I have for today. We are going away to Saranac Lake for a few days so I won’t be back on until Sunday, so check back then for some new recipes. I am bringing some of the homemade bagels and some baked sausage and peppers with me for the weekend for everyone to have. Until next time, enjoy the rest of your day and enjoy your meal! Okay, this dessert may not be ideal for the under age 21 crowd, but it is downright delicious. I had seen the recipe listed on the Cooking Channel awhile back and knew I was going to have to give it a try. I did have to go out and get some bourbon and gingersnaps, but other than that I had all the ingredients on hand to make this yummy dessert. You need to make this one in the morning if you want to be able to have it after dinner that same night or plan on eating it the next day so it can really set. For the pudding base: In a heavy-bottomed saucepan, bring the milk to a gentle simmer over medium heat. In a separate bowl, combine the egg yolks, sugar, brown sugar, cornstarch, and salt. Beat with an electric mixer until light and fluffy, about 2 minutes. Stir a small amount of the warmed milk into the yolk mixture to temper the eggs. Whisk the yolk mixture back into the saucepan with the remaining milk. Reduce the heat to medium-low and cook until the custard starts to thicken, about 3 to 5 minutes. Stir in the bourbon and the vanilla and continue cooking until it is glossy and quite thick, another 1 to 2 minutes. Remove the custard from the heat and whisk in the butter, stirring until the butter is completely melted. Push the pudding through a fine mesh sieve into a large bowl. Press plastic wrap directly over the surface of the pudding and refrigerate for a minimum of 4 hours, or overnight. To assemble: In a medium bowl, beat the heavy cream and vanilla with an electric mixer until stiff peaks form. Fold the whipped cream into the bourbon pudding until no visible streaks remain. 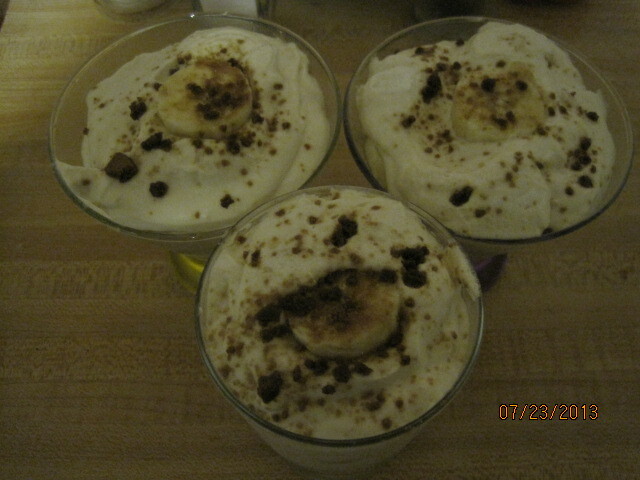 In individual serving glasses, layer the pudding, gingersnaps, and bananas, finishing with a layer of pudding on top. Chill for 4 hours and no longer than 8 hours before serving. Crush the remaining gingersnaps and sprinkle the crumbs over the top. You could certainly serve this in one large bowl instead of using individual glasses, but it does look quite nice in the glasses like this and makes for nice presentation for dessert. I am not a big pudding eater but I really liked this one. You get great flavor from the bananas, a little crunch from the gingersnaps and you can certainly taste the bourbon and vanilla in the pudding as well, all combining for a wonderful flavor. We each ate one up rather quickly last night after dinner. I would certainly make this dessert again if we are having a dinner party. That’s all I have for today. 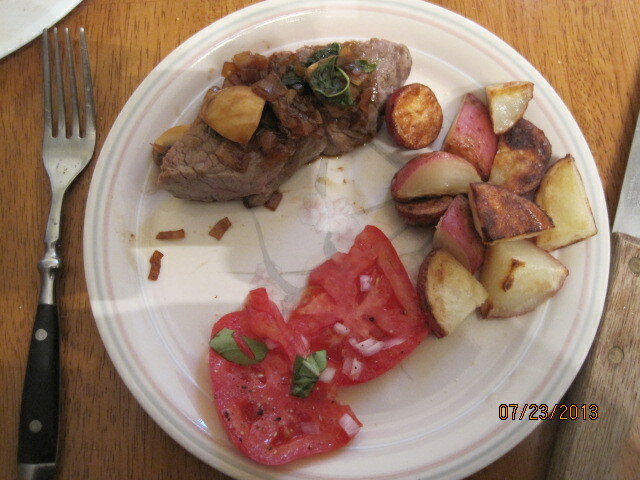 Check back again for other recipes of some things I have tried recently, including a Tuscan steak with crispy potatoes that we had last night for dinner. Until the next time, enjoy the rest of your day and enjoy your meal! After taking a few days off to do some fun family things, it’s back to blogging and back to the recipes. Thankfully the stifling heat we have been experiencing here in New York seems to have eased a bit the last couple of days, giving me a chance to do some cooking again and get some recipes ready to post. I still have a couple from last week that I made when it was really hot, including this easy recipe for grilled chicken tacos. This one is kind of a combination of recipes I got from America’s Test Kitchen and Bon Appetit, using the best of both them to make an easy meal that you can do on the grill or indoors. Whisk together the lime juice, cilantro, Worcestershire sauce, brown sugar, cumin, vegetable oil, salt and pepper in a bowl until well combined. Toss the onion, garlic and chicken thighs until all are well coated. Prepare your grill for medium-high heat. Grill the onions and the chicken thighs until they are cooked through and lightly charred, about 4 minutes per side. Let the chicken rest for about minutes before slicing. 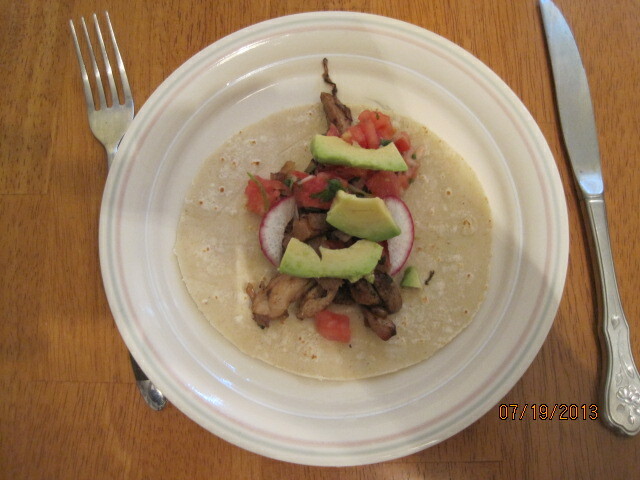 Serve the chicken and onions with the warmed corn tortillas, avocados, sliced radishes, the homemade salsa and some extra cilantro along with lime wedges and sour cream, allowing each person to build their own tacos how they like it. The great thing about this meal is that it can take you no time at all to put it all together. You might actually spend more time getting the grill going then you will with actual preparation and cooking. In our house, there are rarely any leftovers when we make tacos or quesadillas. I served this alongside some black beans and rice that I made and the homemade salsa goes very well with this meal. You can also make some guacamole instead of just slicing the avocados if you prefer to have it that way. That’s all there is for today. Just a very quick and simple recipe that is great for a summertime meal. Check back next time to see some other recipes that I have made recently, including a roast chicken and vegetables from Chef Marc Murphy. a roast beef recipe. some burgers with onion strings from Cook’s Country and more. I do have a few other recipes I’ll be trying out this week as well that I may get on here, so keep checking back. Until next time, enjoy the rest of your day and enjoy your meal! Ballpark Food Recipes: Hot Dogs, Corn Dogs & More : Cooking Channel. If you know me then you know I love baseball. There is nothing better than going to the ballpark and enjoying the game and a few of the snacks they have to offer along the way. Though most stadiums today offer a much wider array of food than ever before (Citi Field offers up a filet mignon cheesesteak sandwich and a shrimp po’boy for example), here are some ballpark favorites and basics offered up by the Cooking Channel so you can make your own and enjoy the game on television in your air conditioning. Check it out!